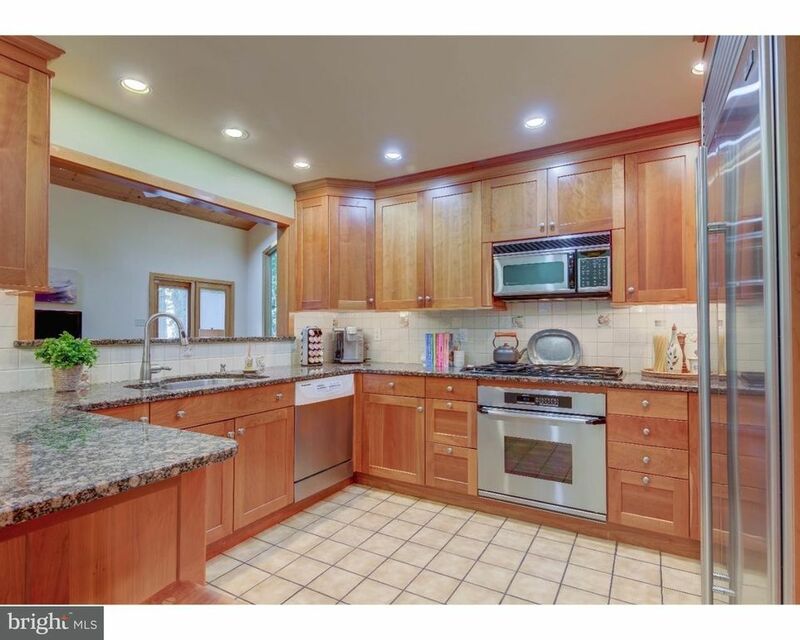 Totally updated 4-5 bedroom Custom Home with Contemporary and Traditional accents situated on a prime 1+ acre acre cul-de-sac lot in this desirable Wayne neighborhood in Tredyffrin Township. The exterior of this home features a new roof, custom Belgian Block driveway, charming walkway to front door, beautiful landscaping and mature trees and an newer expansive maintenance free deck overlooking the private grounds. The interior of this home is loaded with character and quality materials and details which include spacious room sizes, beautiful hardwood floors, an abundance of new windows, newer custom cherry kitchen with granite countertops and stainless steel appliances, a Breakfast Room with vaulted ceiling, two walls of windows, and door to the rear deck, Formal Living and Dining Rooms, and Dramatic Family Room with vaulted wood ceiling and extra long windows. The second floor boasts a large Master Suite with fireplace and spacious bath with whirlpool tub, shower, and vanity, three family Bedrooms, a hall bath, convenient second floor laundry and a large loft area overlooking the family room which is great space for an office or computer area. A finished walkout lower level features a second family room with wet bar, and a 5th bedroom or playroom with closets and new full bath. This spectacular home has wonderful flow making it perfect for both active family living as well as entertaining, and it is conveniently located near the shops and restaurants of King of Prussia, Wayne, and Villanova and within close proximity to all major highways for commuting to Center City or the airport.